As public debates continue over a range of science-related topics, including climate change and the safety of eating genetically modified (GM) foods, Americans are largely skeptical about the degree to which scientists understand these two issues, whether there is scientific consensus on them, and the influences on scientists’ research. 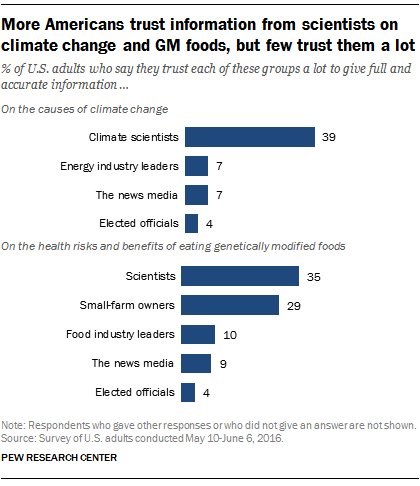 Recent Pew Research Center studies have examined in depth what the public thinks about scientists and their research related to climate change and GM foods. These surveys found that public views of scientific experts in these two areas spring from different factors: When people think about climate scientists, their views are strongly divided by politics. When they think about scientists dealing with GM foods, their views are more closely tied to their level of science knowledge than to their politics. Similarly, 14% of U.S. adults say that almost all scientists agree GM foods are safe to eat, and another 28% say more than half of scientists agree about this. This perception is at odds with a 2016 review of all research on GM crops by the National Academies of Sciences, Engineering and Medicine, which suggests that GM foods are safe to eat. Public trust in information from scientists in both these areas tends to be higher than it is for information provided by several other groups, particularly industry leaders, the news media and elected officials. But fewer than half of the public trusts information from scientists “a lot.” Some 39% of adults trust climate scientists a lot to give full and accurate information about the causes of climate change. A similar share (35%) of adults trust scientists a lot to give full and accurate information about the health effects of GM foods. Public views about climate scientists are deeply divided along political lines, with liberal Democrats much more likely than conservative Republicans to see climate scientists and their work in a positive light. For example, 54% of liberal Democrats say climate scientists understand very well the causes of climate change, compared with 11% of conservative Republicans. Republicans who are moderate/liberal and Democrats who are moderate/conservative fall in between these two extremes. 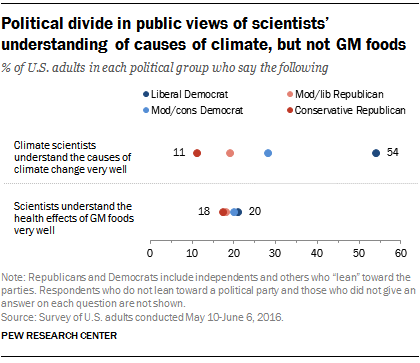 By contrast, when it comes to views of scientists connected with GM foods, political partisans are much more in agreement. For example, 20% of liberal Democrats and 18% of conservative Republicans say scientists understand the health effects of GM foods very well. Instead, people’s differences on views of scientists who study GM foods and their research are associated with their level of science knowledge. Those with more science knowledge – measured by a nine-item index – tend to see scientists working on GM foods in a more positive light. About half (51%) of those with high science knowledge trust scientists a lot to give full and accurate information about the health effects of GM foods, compared with 18% among those with low science knowledge. Despite public skepticism about scientists working in both areas, most Americans think scientists should have a major role in policy decisions. About two-thirds (67%) of Americans say climate scientists should have a major role in decision making about climate matters. 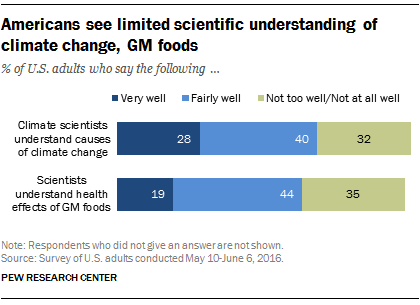 Six-in-ten Americans (60%) think scientists should have a major role in policy decisions related to GM foods. 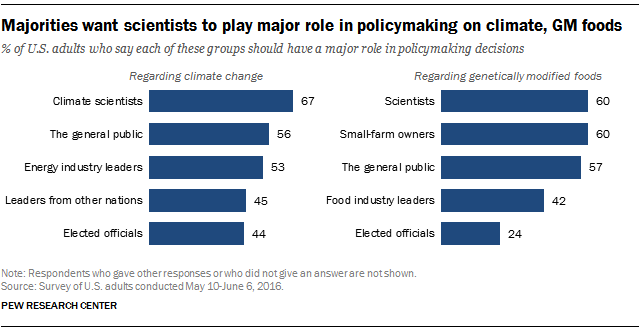 Scientists are not the only group Americans support at the policymaking table: At least half of U.S. adults think the general public should have a major role in policy decisions on climate change (56%) and GM foods (57%).